Leaving Rüdesheim am Rhein was not easy. 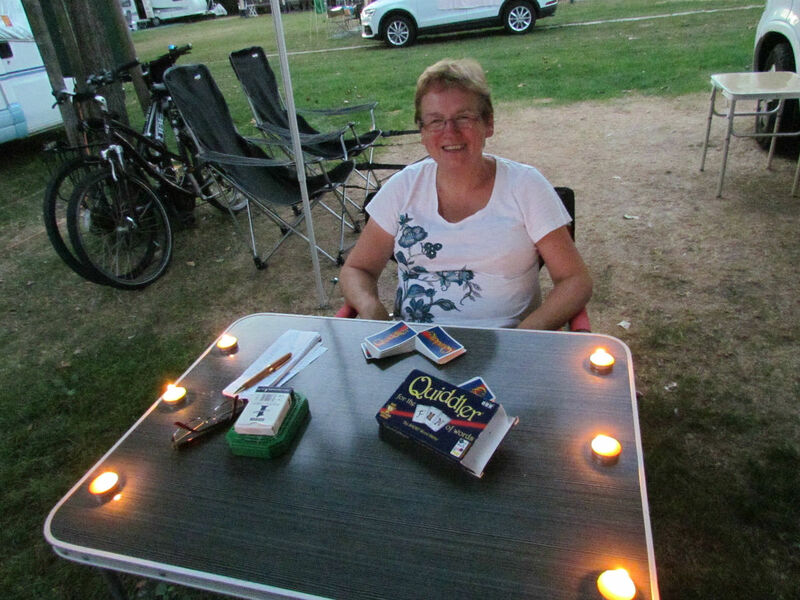 We had come to love our nightly strolls along the river promenade admiring beautiful cruisers and then sitting outside in the cool of the evening playing Quiddler and drinking beer. We packed the van early and were ready to leave in good time and set off through the town, stopping off at Aldi for a change from Lidl. We really know how to live! Our satnav is a cheap trucker’s model (the satnav is the cheap one, not the trucker you understand) and the vast majority of the time it gives only sensible directions, avoiding all narrow roads and low bridges. Sometimes a little warning comes up to say that the place we’ve put in isn’t suitable for large vehicles but we’ve learned that this usually just means that the entrance to the campsite is narrow. The warning came up as usual, as I put the address of St Hildegard of Bingen’s Abbey into it and I ignored it – as usual. First mistake of the day. We found ourselves driving into a very narrow road with cars parked on both sides. The Abbey was above us, high in the vineyards, so we knew we were in the right vicinity but the route was looked distinctly unsuitable. Should we keep going or reverse about half a mile? A very kind German gentleman stopped his flashy sporty BMW and wound down his window. “Can I help?” he asked in flawless English. So we asked if we were going the right way and whether our van would fit. He was certain we could get to the Abbey that way but not so sure about the size of the van. Eventually he advised that we drove slowly and hope for the best. We crept forward. To our relief we edged out of the other end of the narrow lane and found the main road coming up from the town with the entrance to the Abbey visible up the hill. St Hildegard’s is the home of an order of Benedictine nuns who have been making wine there since the 12th century, The place is wonderfully peaceful and exquisitely kept. Rows of immaculate vines trail off in all directions and the views down to the town and along the Rhine are almost magical. We sat quietly in the Abbey for a short while, just listening to the silence and taking in the atmosphere, then wandered into the gift shop where we did indeed see nuns in full habits offering wine tasting. As we share the driving we had to decline but we did partake of the coffee and fabulous cake in the coffee shop. There is a small presentation about the convent and we were very happy to find translations into English describing the life and work of the nuns. Some of it was very moving, including the fact that they have prepared and furnished a cottage in the middle of the vineyard for a family of six Syrian refugees. “All our lives have been enriched by their presence,” they wrote. Before we left I went into their ladies toilet and saw a notice asking for donation of 50c for the use of the loo. I only had 35c in change in my pocket but I decided that as it was only a quick pee it wasn’t too serious a sin, so I popped my few cents in the box and scarpered. The satnav hadn’t finished having an off day and, instead of directing us to the ferry over the Rhine, she wanted us to drive 16 miles out of our way to a bridge. We ignored her and hoped she would feel better later – and indeed she did. Two hours later we pulled into the Stellplatz at Bad Dürkheim. The first thing we noticed was the big wheel rising up out of an enormous fairground. Then, arriving at the Stellplatz we saw that half of it was packed full of caravans belonging to the fairground people. We hesitated: should we? shouldn’t we? – then we saw that the motorhomers were in a separate area and that everything was marked out ready for different kinds of parking so we paid up and settled in. As soon as the kettle was on and the front seats turned round ready for relaxation, I put on the 3g mi-fi to find out what it was that had made us think that Bad Dürkheim as a good idea. Neither of us could remember, except that it’s about half way to Baden Baden. It turns out that this very weekend, Bad Dürkheim hosts the biggest wine and sausage festival in the world. We weren’t sure whether to laugh or run for our lives. The festival runs for two consecutive September weekends, Friday to Monday and this was Thursday. It was obvious that by the next day the whole town would be hooching so we decided to take a walk around, get a feel for the atmosphere and decide then whether to stay another night. We strolled into town where I spotted this notice that appealed to the psychologist in me. Arriving in the middle of the festival area we discovered that some of the wine bars and sausage stands were open. It seemed that, quite by accident, we had hit upon a way of experiencing some of the festival without being caught up in enormous crowds. The system for trying the wine and eating the sausages is quite simple. They have benches with narrow tables under awnings stretching between temporary wine bars and sausage sellers backing onto the bars. You buy your food, sit anywhere you like, and a waitress comes along to ask what you want to drink. We shared our area with a bunch of merry Germans who were singing and slapping their thighs. I was a little disappointed that they weren’t wearing lederhosen. I had read on Trip Advisor that you can order your wine in a tall glass with half and half wine and sparkling mineral water. This is my usual method of drinking wine because I’m a cheap date that can’t handle much alcohol, so I was very happy with the idea. The waitress told us that this is called Shorle and she advised Riesling Trocken, because we said we prefer dry wine. All well so far – until I discovered that the Shorle consists of 250 ml (i.e. 1/3rd of a bottle) of wine, topped up to half a litre with mineral water. The sausage and chips were not up to the task of absorbing that amount of alcohol and when I stood up to take a picture of Shirley I found that the ground was spongy and uneven, where it had been flat and solid when we got there. We strolled back up to the Stellplatz and Shirley tells me that she gave me coffee and dark chocolate when we got back. I have no real recollection of this act of kindness but I’m grateful for it. When I sat down in the van Shirley advised me very seriously, “Now, do not under any circumstances email anyone tonight.” She’s obviously made that mistake before. In fact, to tell you the truth, the very first email she sent me was when she’d had a few glasses of wine and look where that got her! We had a lovely quiet evening in the van then fell into bed and slept like logs. We decided that one night was enough and moved on again bright and early the next morning for Baden Baden – “so good they named it twice”, quipped Shirley. The Baden Baden Stellplatz has mixed reviews on Camper Contact. Some say that it’s too noisy, being close to a road. Others said it was a bit far from the centre, 3km by bike on a bike track. Neither of these issues bothered us. We’ve been sandwiched between two railway lines and next to a circus – you can’t scare us. The cycle ride into town isn’t far either, although working out where you’re allowed to cycle and where you have to walk is more of a challenge. The plan here is to visit the thermal baths. We are on the one week countdown to Shirley’s big birthday and the birthday treats have begun. We cycled into town via Tourist Information (excellent again – things are looking up) and parked our bikes near the pedestrian area. We then walked to the thermal baths to make sure we know where we’re going for the real thing tomorrow. This habit of going somewhere before you actually have to go there in order to make sure you know where ‘there’ is – it being better to get lost before the event than for the real thing – is a habit I learned in childhood. When I was going to Huddersfield Polytechnic at the tender age of 16 to study music, my mother took me there in the school holidays to make sure I could find my way around. We were trying to work out which bus to catch when she flagged one down, spoke to the West Indian bus conductor and said “Where is this bus going?”. He flashed a big toothy grin at her and shouted “Trinidad!” to which a crowd in the bus cheered. Anyway – where was I – oh yes, the thermal baths and trying not to get lost. We did find them eventually and received good advice to get there early in the morning if we want a quiet spa experience. Wandering back through the town Shirley spied an Italian café that sold huge ice cream sundaes. Being day one of the birthday celebrations was all the excuse we needed. Bon appetit! you two seem to be having a great gastronomic trip at the moment – and that’s it started before the week’s build up to Shirley’s birthday!